The Voice Behind Successful Commercials, Promos, Corporate Videos, Podcasts, Documentaries, Fundraising and More! Hire voice-over talent Paul Minda to make all of your voice-overs and narrations more distinctive and engaging. His pleasant and unique voice will surely captivate any audience. Book him now. Email paul@bomincom.com or call (508) 881-3048 or (508) 740-1189. Voice of the 2015 New England Emmy™ Awards - New England Emmy Nominees Take Advantage of Great Rates for ISDN and Recording! Paul Minda is arguably one of the best voice-over talents based in Boston, Massachusetts. He has been a voice-over talent and actor for more than 15 years, "telling stories" (whether it's a 30-second commercial or a 20-minute documentary) and imparting messages to audiences of all types. Paul is highly experienced and versatile. He has lent his voice to thousands of documentaries, narrations, promos, commercials, webcasts, and live events. Top brands trust Paul to do be their voice. These brands include Colgate™, Hasbro™, and CBS™ (See his resume). Clients love the quality and consistency of his voice-over in Boston, MA, coupled with his work ethic to always get it "right." Paul possesses the ability to give you more than what you expect. He is great at interpreting what the script calls for and reacting quickly to instruction, saving you time in the recording studio. As a seasoned voice-over actor, he handles medical and technical terminologies effortlessly. All of his recordings are available in MP3, WAV, or AIFF files, and ISDN access is available. Meaning is all in how a message is conveyed. Ensure the right message is being sent to your audience when you hire Paul Minda, a professional voice actor. Paul approaches each project with passion, providing a powerful force filled with emotion that touches the mind and soul. If you’re looking to make an impact, there’s nobody better to turn to for voice-over in Boston, MA. If you’re looking for a voice that rings with confidence and trust for a documentary on a critical topic, he’s up to the task. On the other hand, if you need a light and witty tone for an upbeat TV voice-over, it’s well within his skill set. He knows how to interpret the material in the best manner to get the most out of it. His experience and preparation allow him to deliver the script just as you imagined it beforehand. Engaging, emphatic, or erudite, he can be this and much more. 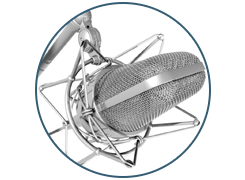 A professional voice-over artist makes the difference between ho-hum marketing material and material that has your target audience clamoring for your product.